SoFi offers a fresh and innovative approach to lending that differentiates its services from traditional brick and mortar lenders. The company was founded by four graduate students at the Stanford Graduate School of Business in 2011. The group wanted to make a commitment to offering a service that could help graduates pay back their student loans while bypassing traditional lending institutions. From there, the concept expanded to accommodate a wider variety of borrowing needs. In the time since, SoFi has worked hard to make good on their commitment, becoming one of the fastest growing alternative lenders in the industry after extending over $7 billion in loans to date. SoFi offers a variety of technology driven financial lending and money management solutions including wealth management, loans, and even life insurance. Additionally, SoFi works with customers to help them achieve stability, plan for their future, and reach their personal finance goals. An alternative to the traditional lending system. SoFi’s marketplace lending model allows users to connect to the best borrowing opportunity without dealing with intermediaries such as banks or other bureaucratic roadblocks. If you need to restructure or deal with student loans, or are simply looking for a wealth management service, SoFi provides a fresh approach. Financial stability. If you prefer a lending solution that not only seeks to work with you, but also helps you plan for the future, build your credit, or simply shape a better understanding of your financial reality, SoFi stands out as an excellent option. ​Applying for a loan with SoFi is simple, and though approval can take slightly longer than with some competitors, this is related to the company’s pledge to ensure responsible lending and transparency. SoFi’s loan amounts range from $5,000 to $100,000, although the higher amounts are reserved for applicants that have credit scores over 680. SoFi's approval process is not long, but can be expedited if you prequalify. To apply, you are required to fill out an online application, after which the company will do a soft credit pull—with no impact on your credit—and if you are approved, you will move on to a more rigorous qualification process. The online segment can be completed in a few minutes, although the full process can take slightly longer depending on your specific qualifications and credit score. Once you have completed the application, you will learn if you have been approved, and if so, you will be contacted by SoFi to establish the terms of your loan. After that, your loan will be transferred into your account. Due to its more involved qualification process, SoFi’s loan application takes a little longer than other personal loan providers in the industry. However, this comes with some benefits and advantages that make SoFi such a great choice relative to peers. In order to apply, you simply need to create an account with SoFi. The initial application process takes about 10 minutes, and once you’ve been approved, the qualification process will take a little longer depending on your personal information. SoFi’s rates can change somewhat depending on how you choose to pay your loans. If you opt for automatic payments, the company can offer better interest rates. The best part is that it has zero fees of any kind any of its personal loans. SoFi loans are primarily aimed at young professionals and recent graduates. The company’s goal of helping people deal with student loans while instilling a sense of responsible decision-making makes it a top choice if you are a recent graduate and looking to establish your credit history, refinance your student loans, or simply learn to handle your finances better. SoFi’s products are generally designed for customers that have better credit scores. Part of the reason why it can offer such competitive interest rates is its focus on customers with more proven financial track records. Furthermore, you can still apply for a loan from SoFi even if you were not recently a college student. All of SoFi's loan amounts are available with 6 different repayment terms of 2, 3, 4, 5, 6 or 7 years. Unlike some personal loan providers that only issue fixed loan amounts for predetermined terms, SoFi allows you to choose your amount and your term. The only factor that is impacted by choosing a different repayment term is the interest rate, which will generally start at the low end of the range for shorter terms. SoFi places a premium on its customers’ personal information security, and works hard to avoid any data breaches. The company’s site features robust 256-bit Secure Sockets Layer technology that encrypts transferred data and includes military-grade protection. When it comes to entering personal information, SoFi asks for pertinent data only when necessary. While you are required to enter some personal information when first applying including details such as name and address as well as employment and education history, you only need to provide more specifics once you have been initially approved for your loan. As part of its customer service, SoFi features a standard FAQ section to help answer common questions and queries while also providing an excellent suite of resources that are designed to help people better understand loans and personal finances. Moreover, it offers community events and assistance programs for entrepreneurs to network. You can reach SoFi via e-mail or call its customer support weekdays during normal business hours. SoFi has impressive loan terms and a high maximum loan amount, but if you have a lower credit score LendingClub​ is a solid option as it accepts borrowers with credit scores starting at 600. When comparing SoFi and LendingClub there's not much in it when it comes to minimum APR but SoFi pulls ahead with a very low maximum APR, offering very attractive loan terms overall. Marcus is another lender that has some similar features as SoFi, offering competitive APRs and flexible loan terms. However, while SoFi charges just $5 or 4% as a late payment fee, Marcus doesn’t charge any fees at all, not even any late fees. Read more about how Marcus and SoFi stack up against each other. SoFi’s has worked hard to set itself apart in a crowded industry by providing a transparent offering with a customer-first approach. Despite some small downsides such as high minimum amounts and a slightly longer approval process, the company’s low interest rates and dedication to customer education make it a top choice when it comes to getting a personal loan. Furthermore, SoFi's efforts to teach better personal finance skills and professional development resources make it an excellent partner in furthering your financial ambitions. Excellent value-added services such as unemployment protection and job-search assistance also put it at the top of the class among its industry peers. 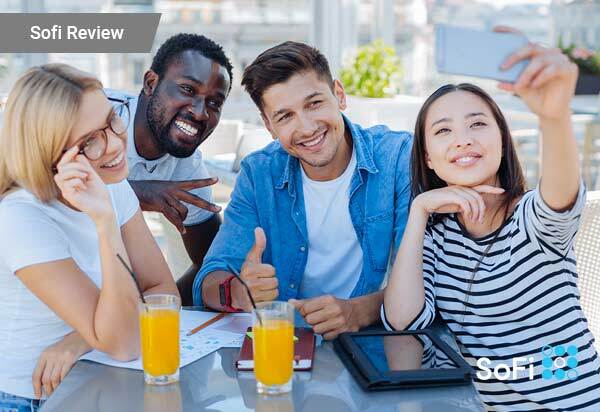 All in all, SoFi is an excellent alternative for young professionals who are looking to build their credit through responsible borrowing, as well as aspiring homeowners or those seeking to refinance loans with unfavorable terms. SoFi presents an outstanding choice for borrowers with strong credit scores thanks to its dedication to financial education, overall lending transparency, and strong customer-facing solutions. My credit isn’t perfect, can I still get a loan? With SoFi you need a relatively high credit score of 680, but there’s good news too. The company takes a holistic view of your credit score, and examines things like your financial history, expenses, income, and career experience. In addition, the company doesn’t have any restrictions on debt-to-income ratio and when the it checks your credit it will do a soft credit pull, which will not affect your credit score. What can I use a SoFi personal loan for? There are some restrictions on SoFi loans. You can borrow from $5,000 to $100,000 to use for personal, family, or household purposes, but the loans cannot be used for real estate, investment, buying securities, higher education, short-term bridge financing, or business purposes, according to the company. After you’ve finished the online application - and assuming you are approved for loan - SoFi will contact you to put an electronic signature on a loan agreement. After signing, you should receive the funds within a few days. What types of fees does SoFi charge? SoFi does not charge any fees for origination, closing, or prepayment. Also, as of April, 2018, SoFi does not charge late fees on personal loans.